With the ever increasing threat of global warming, the future of the environment is probably the most important issue facing mankind today, although you wouldn’t know it by the behaviour of most people. Some might vote Green and do a bit of recycling, but for most of Capricorn Research’s generation, the closest they came to becoming environmentally friendly was watching the TV sitcom, ” The Good Life “ in the 1970s. The show was about a midlife crisis experienced by Tom Good, a 40-year-old London plastics designer, who with his wife Barbara, attempts to escape modern commercial living by “becoming totally self-sufficient” in their home in Surbiton. It was one of those iconic programmes watched by virtually everybody which turned the main players in the series into household names, particularly Richard Briers who played Tom. Briers had a wide ranging acting career that took in everything from sitcom to Shakespearian tragedy, but as is often the case when an actor is so strongly associated with one role, that part is clearly identified in the chart. The sign that is most associated with a narrow conventional approach to life is Capricorn. The planets that are connected to rebellion are Uranus and Pluto. A midlife crisis is associated with the early forties, the reason for this is to do with Uranus. Everyone knows that a Saturn return at the age of 29 and 59 is to do with accepting limitation, becoming more conservative and settling down to focus on the essentials of life. Uranus has the opposite effect. Uranus takes 84 years to perform a complete cycle of the Zodiac, but after 42 years it is opposite its natal position triggering a strong urge to disrupt things, to break away from narrow constraints and to throw everything out of the window to start something new. It is in effect a rebellion against the Saturn principle. 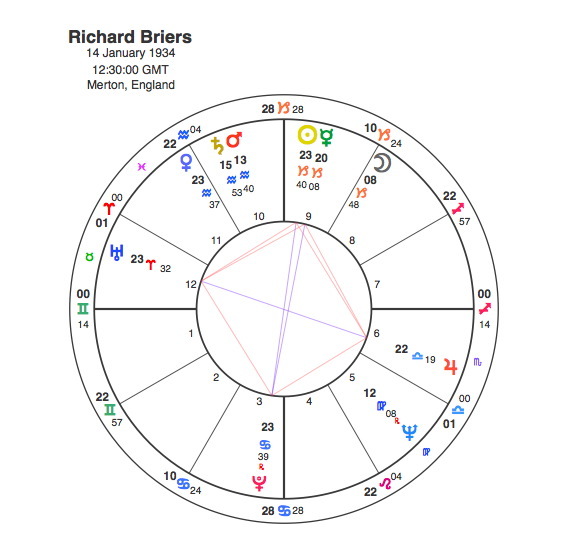 So what better combination for Richard Briers / Tom Good to have than the Sun in Capricorn opposite Pluto square Uranus. The staggering thing about this aspect pattern is that it is exact, all three are at 23 degrees of their signs. Self sufficiency is a very Arien concept and working from home and on the land is beautifully Cancerian. As a Sun / Moon Capricorn, Tom is very practical and able to put his hand to anything. So Tom gives up his conventional career ( Sun in Capricorn ) to follow his own personal rebellion ( Pluto ) to work on the land at home ( in Cancer ) and is seen by his neighbours as being utterly eccentric ( Uranus ) in his drive for self sufficiency ( in Aries ). Briers / Good also has a Mars / Saturn conjunction in Aquarius. This is an important aspect in the chart and provides much of the comedy in the show. Mars in Aquarius shows a powerfully idealistic character who is always coming up with new schemes. The conjunction with Saturn ensures that a lot of these ideas are frustrated and don’t come to fruition, but Tom’s Mars is not disheartened, he continues to come up with more Mars in Aquarius plans. The Sun, Pluto and Uranus are part of an exact Grand Cross ( the closest Capricorn Research has seen ) which includes Jupiter. Jupiter’s position here gives nobility and optimism to Tom’s cause and it’s sign position in Libra shows where his biggest supporter is. Felicity Kendall played the part of Tom’s wife Barbara, who despite being a gentle Sun / Moon Libra also had an idealistic streak with the Sun and Moon conjunct Neptune and was happy to don her dungarees and get muddy. Kendall / Barbara’s Libra planets are in square to Briers / Tom’s Moon so she is drawn along with him. There is a strong synastry between their two charts but this is nothing compared with the scriptwriters of the series. As is often the case with TV comedies, scriptwriters work as a pair and the two responsible for ” The Good Life ” were John Esmonde and Bob Larbey. Both writers have their Sun in the early degrees of Cardinal signs, Esmonde at 0 degrees Aries and Larbey at 2 degrees Cancer. Esmonde and Larbey have exceptionally strong synastry in that their Suns are in close square and their Moons are in close trine aspect. Their Suns connect strongly with Briers’ Moon and Kendall’s Sun and Moon. Esmonde’s Moon sits conjunct Briers’ Pluto and opposite his Sun, whilst Larbey’s Moon is trine Briers’ Pluto and sextile his Sun. Such powerful synastry would mean these four characters would inevitably be drawn together, but it would also mean that their Pluto watershed periods would occur at roughly the same time in the 1970s. Richard Briers Pluto moment occurred in 1975 when the Good Life was first screened as it was square his Moon. 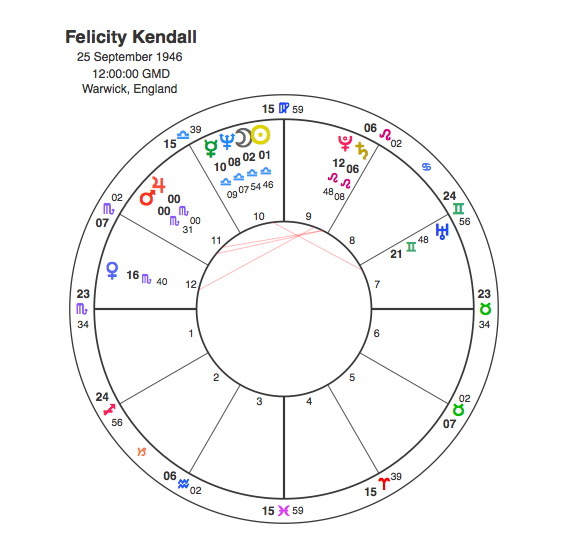 Pluto had already made conjunctions to Felicity Kendall’s Sun and Moon in 1972 – 3 but it was also conjunct her Mercury and Neptune in 1975. John Esmonde and Bob Larbey had Pluto aspecting their Suns between 1971 and 73. This was almost certainly during the period when they first came up with the idea for the show. Larbey’s other Pluto moment was when it was conjunct his Moon in 1992 with the first screening of his other great success “As Time Goes By ” with Geoffrey Palmer and Judi Dench. But for Richard Briers, the Pluto transit to his Moon in 1975 was as Good as it gets.